From thick crust to thin crust, with veggies or all meat, covered with red sauce or white sauce, made from scratch or bought frozen at the store, cooked in a brick-oven or on a conveyor belt, served hot or cold, there is an endless realm of possibilities for the pizza industry. However, while the community of Fargo-Moorhead offers a large variety of pizza options, there was just one style they were missing. It wasn't until late 2009 when Todd Berning and a few of his friends realized the need for New York style pizza throughout the FM area that Spicy Pie opened in Downtown Fargo, introducing a whole new style to the pizza industry. "It started in Downtown Fargo about 7 1/2 years ago by a couple of us who were in the business...we just thought a pizza place downtown would be nice. It would offer some variety, be a little quicker, and people could buy it by the slice just like in New York." And thus, Spicy Pie was born. Known for its New York style pizza, this unique pizza joint offers bigger pizzas, bigger slices, and the ability to order by the slice. A typical New York style pizza is bought by the extra-large, foldable slice with customizable toppings and light on the sauce. Spicy Pie makes all their pizzas on the spot with fresh meats, vegetables, Saputo cheese, and Alta Cucina tomatoes all on top of hand tossed pizza dough that is thrown into a brick-oven to cook to perfection. However, it's not only just pizza slices that Spicy Pie has to offer. They also sell 18-inch pizzas, as well as tacos, grinder sandwhiches, and tostadas, all made fresh each morning. 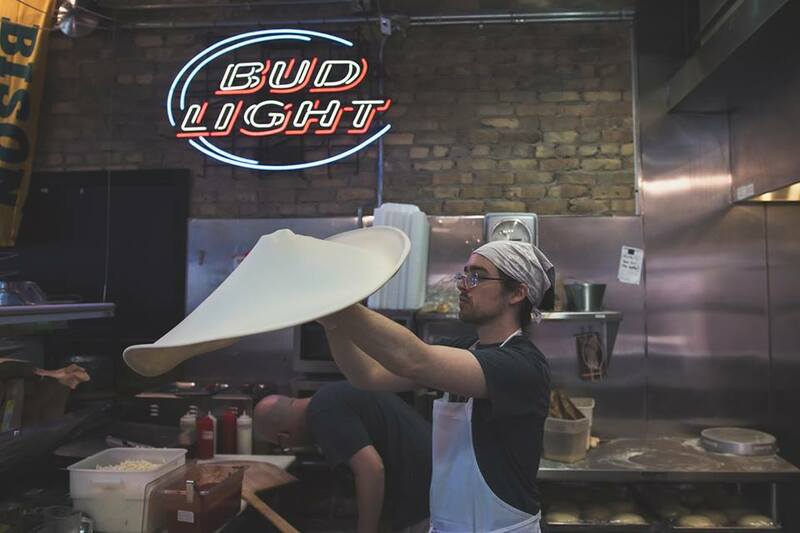 With their main focus on opening and offering this unique style of pizza in Downtown Fargo first, Todd and his friends got to work. Business was booming and the restaurant was busy. It wasn't soon after business began that they saw the potential to expand throughout the Fargo-Moorhead area and beyond. All they needed was the financial resources to continue their day-to-day operations as they looked into and invested in options that would allow them to expand and open new location. "We started off with a vision to just be in Downtown Fargo and do something there and it just kind of took off from there. So, we thought, how can we grow?" Because of his familiarity and previous experience in the real estate development business, Todd was aware of the different loan and financial resource programs available. One program he thought of was the U.S. Small Business Administration 504 loan program. "We expanded pretty quickly over a couple of years so we thought this program could help us leverage financing and get our stores open." He eventually got in contact with Dakota Certified Development Corporation (now Dakota Business Lending) and worked with their team to secure an SBA 504 loan. The low down-payment, fixed interest rates, and 10- and 20- year terms helped Spicy Pie maintain cash flow for daily operations while they worked to expand and open new locations in different markets. "The Dakota CDC (now Dakota Business Lending) team is really thorough. They want to understand your business and help figure out what makes sense. It was a good tool for us." Spicy Pie utilized this loan program to open up a new location on the North Dakota State University Campus in Fargo, hoping to attract and provide a nice place to hang out and enjoy unique, New York style pizza for the college students throughout the area. This kept Spicy Pie very busy, especially throughout the school months. With their success in both of these areas, it wasn't long after that Spicy Pie decided to extend its market outside of the FM area. By utilizing the SBA 504 loan program 4 more times, they soon opened a facility in Minot, which is where their main office is currently located, and in Grand Forks. Since then, Spicy Pie has continued to expand to West Fargo, South Fargo, Grand Forks, and finally on the Moorhead State University campus almost exactly two years ago. "There's highs and lows and you just have to work through them. Have a partner that you can extend some low interest terms and lessen the need of cash flow every single day. You just have to have plenty of capital." Spicy Pie has continued to maintain a high popularity throughout the communities in which it serves over the years. Todd explained that they are always in either the Top 5 or Top 3 for Best Pizza in Minot, Grand Forks, or Fargo-Moorhead. "We're always up there towards the top and that's all we can ask for. It's nice to see because a lot of those votes came from customers and that's what's most important," added Todd. Despite any challenges that the human side brings to small business owners like Todd, he also claims the joy from both the employees and customers of Spicy Pie is by far one of the most rewarding things about his job. "Last night, I came into the store just to check in and see how things were going. The employees were having fun and handling it and the customers are having a good time and enjoying the pizza. Then, you know you have succeeded." Their secret to maintain this bright atmosphere for both employees and customers? Spicy Pie stays involved and interactive with the community. Their current program, Partner with a Pie, allows Spicy Pie to work with churches, educational groups, and charities throughout the Fargo-Metro area and in Grand Forks and Minot. Through Partner with a Pie, Spicy Pie develops partnerships with these organizations so their constituents get a discount on pizza and the group they are a part of also gets money back for using their code. "We're really working on that community aspect," Todd added. "We're not big enough to do mass media like the big boys and we're a little bigger than the "Ma and Pa" places so our niche is really getting involved in these community groups."